In small bowl, mix 1 teaspoon lime peel, 1/4 cup lime juice, the honey, dill weed and oil. In 8-inch square (2-quart) glass baking dish, arrange salmon pieces, skin sides up, in single layer. Pour marinade over salmon; turn in marinade to cover all sides. Cover with plastic wrap and refrigerate 20 to 30 minutes. Heat gas or charcoal grill. Carefully brush grill rack with oil. 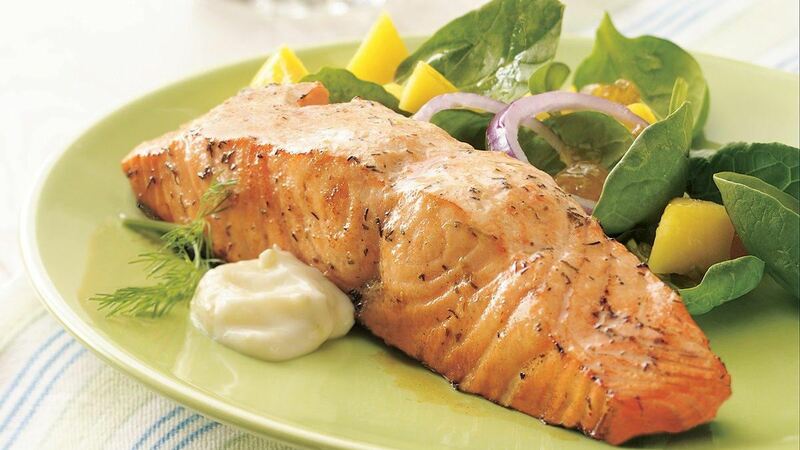 Remove salmon from marinade; discard marinade. Sprinkle salmon with salt. Place skin side down on grill over medium heat. Cover grill; cook 10 to 15 minutes or until salmon flakes easily with fork. Meanwhile, in small bowl, mix Lime Cream ingredients with wire whisk. Serve with salmon. Did You Know? : Get in the habit of serving fish at least once a week. Salmon is high in heart-friendly omega-3 fatty acids, plus it's tasty! Serve-With: Serve this salmon with pasta or rice and a spinach salad.